text beneath heart top left? text beneath heart top right? text beneath heart bottom left? text beneath heart bottom right? text at bottom of frame? 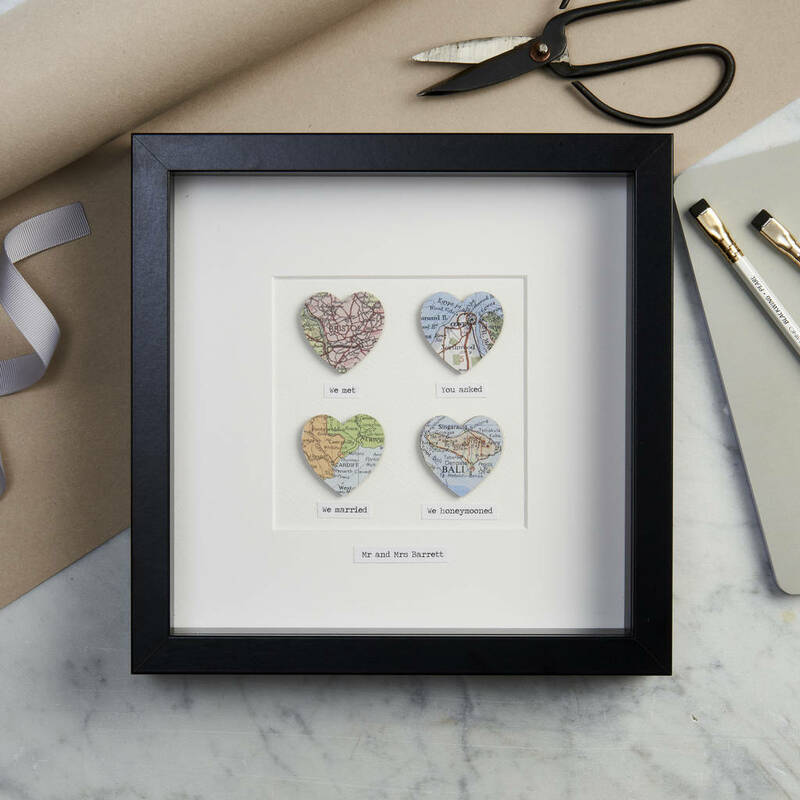 A beautiful personalised four hearts message map picture with your chosen locations and optional messages beneath. 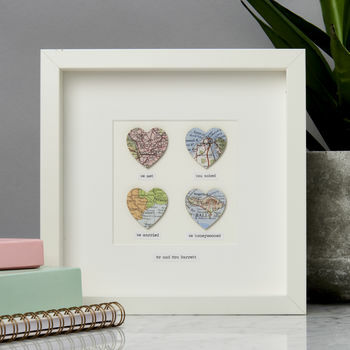 These vintage map pictures are handmade using a stunning and authentic collection of vintage maps (please see notes below) to show your chosen locations. Designed with four small raised wooden hearts, your maps are glazed on top so they stand out in the box frame. 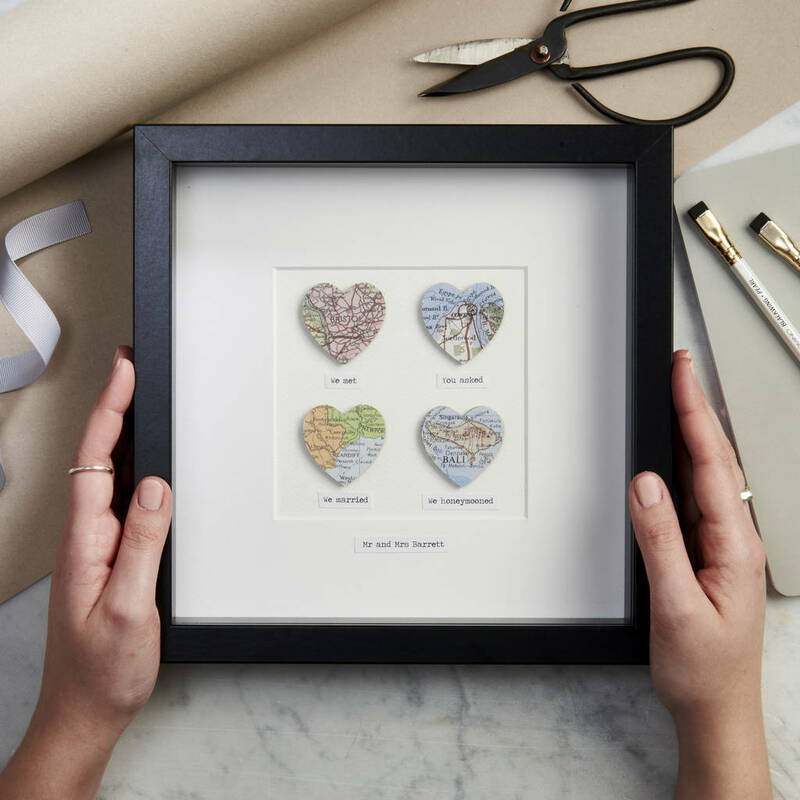 Beneath each map heart, write an optional message describing the place and why it is special to you. At the bottom of the mount, you can personalise with an extra sentence. 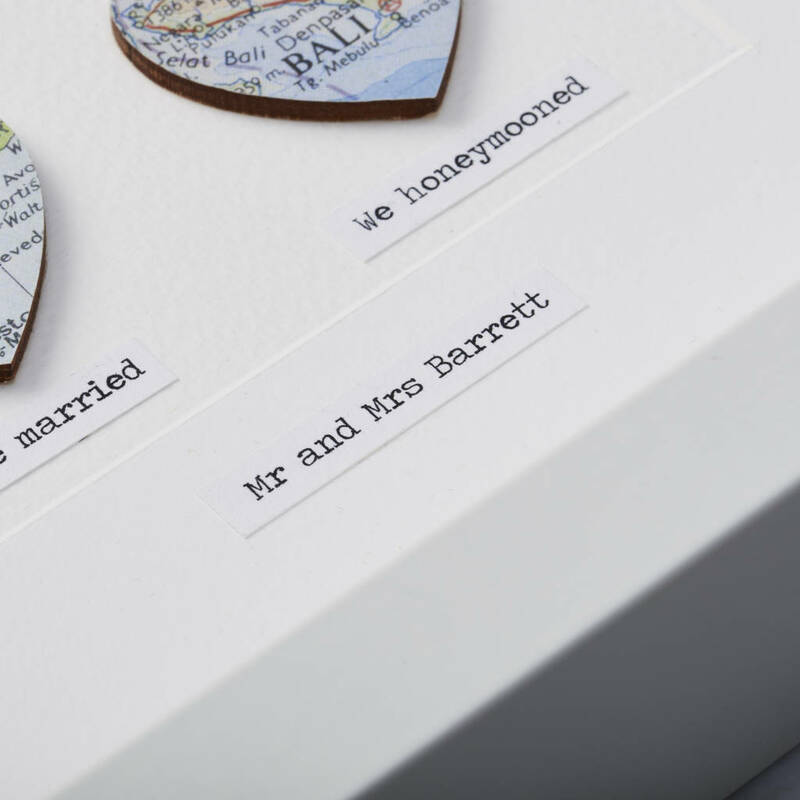 A thoughtful anniversary, birthday, engagement or special gift for a loved one. We use a collection of authentic vintage maps to source our locations so it is near impossible to show every location in detail - particularly images of roads, landmarks or specific buildings etc. We ask that you choose a town or city (worldwide) so we can successfully find your location. Please provide as much information as possible about your chosen location. Our international maps may be less detailed and small islands (such as the Seychelles, Maldives etc) are unlikely to be shown in close detail and will be shown as the whole island. If we are unable to show your location named we will show the relevant area with as much context as possible. We cannot check for locations prior to purchase. Please also be aware that as we use authentic vintage maps there may be a variation in your location's spelling or it may have changed over the years. Our frames have front protection with shatterproof plastic making the frame safer to use. Framed pictures measure 23cm x 23cm. Unframed pictures measure 23cm x 23cm and the inside picture measures 12cm x 12cm. This product is dispatched to you by Posh Totty Designs Creates.